Gordon Ferris has built up a considerable following via the e-book versions of his books. THE UNQUIET HEART, first published in 2008 by Creme de la Crime, is here reissued by Atlantic Books and is the second title to feature Scottish private eye Danny McRae, following TRUTH DARE KILL. Ferris's characters are definitely his greatest strength. On the one hand, McRae is a typical investigator/hero - ex-policeman, ex-SOE, handy in an action sequence, a hard drinker, cynical but driven by the need to do right; on the other, he is emotionally vulnerable. His wartime experiences, notably a stay in Dachau, have left him physically scarred and still reliant on regular visits to a psychoanalyst. He does not always trust his own judgement. His growing relationship with the journalist Eve shows him to be as insecure and self-doubting as any teenage boy with his first girlfriend. It's an interesting mix, and should win you over. The supporting cast are also individual enough to be interesting. Eve in particular goes a lot deeper than her ambitious journalist façade and surprises more than once as the story progresses. Ferris stacks up pretty well as a historical novelist. His research doesn't show through too strongly and he hasn't let the history swamp the story. He manages to convey the dreariness of post-war London and the desperation of occupied Berlin without bulking the text out with too much period detail (although at times there's a bit too much about chicory coffee). 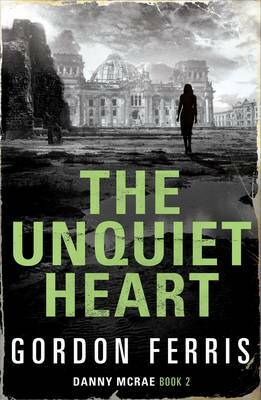 Overall, THE UNQUIET HEART is an engaging read, with strong characters and a nice sense of period. Thoroughly recommended.